XTND is a technology startup headquartered in California that focuses on making intelligent electric products for the modern mobility landscape—yet the company’s innovations are all Czech-grown. The Ostrava-based entrepreneurs, led by founder and CEO Miroslav Peřina, have developed what they are calling the world’s first electric longboard with AI software, an incredibly light, thin board (it weighs 6.6 lbs/3 kg) made of carbon fiber with a fast-charging built-in battery system. The board, which can go up to 28 mph/45 kph and has a charging time of 60 minutes, was designed with urban landscapes in mind, a futuristic solution to bus schedules, parking, and traffic jams. According to PR materials from the company, the board monitors the correct position of the feet and immediately brakes during an accident. The software is also said to adapt to a user’s driving style and the terrain over which it’s operated and can recognize driving abilities and adjust reactions and speed limits accordingly. 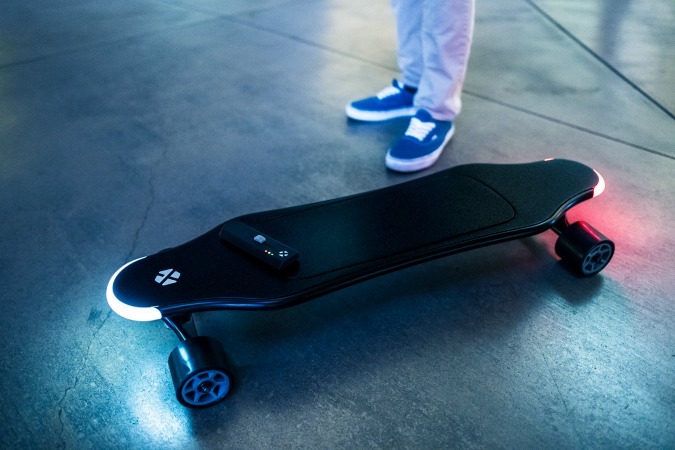 Electric skateboard enthusiasts pledged over 100,000 USD within a few hours of the XTND’s Kickstarter campaign launch back in May (the goal was reached in July); a large number of backers came from Prague and the Czech Republic. The Ostravans behind XTND are not the only brilliant minds from the Czech Republic angling to break through with an electric longboard: Brno startup Watt also offers an attractive electric ride, though without the smart features of the XTND.